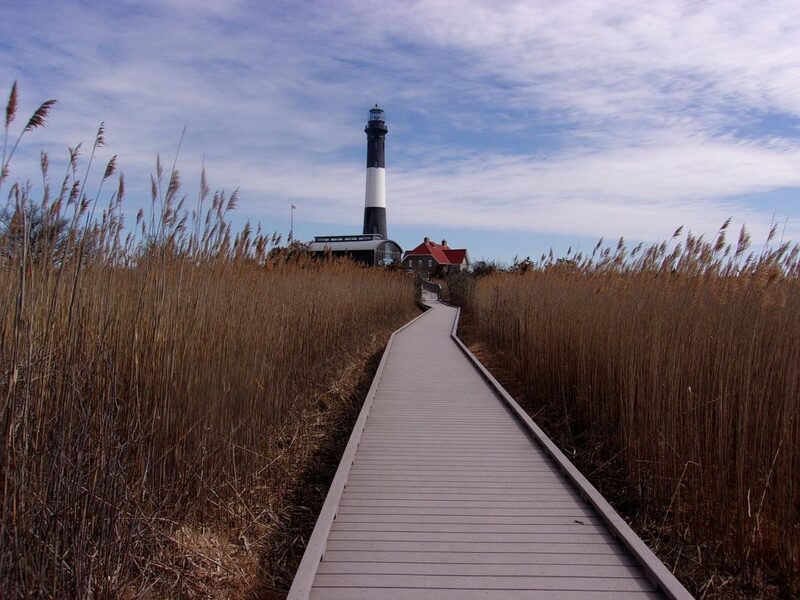 Once summer hits, there’s one place in New York State you have to visit: Fire Island. Famous for its gorgeous beaches, gorgeous sea, and gorgeous men, this tiny island has everything you need for a classic weekend break. A long-established gay Mecca, this island just below the coast of Long Island has provided joy in the sun with beautiful people for decades. Here you can find national parks, car-free communities and vibrant gay nightlife. Neighborhoods like Cherry Grove – America’s First Gay and Lesbian Town – and Fire Island Pines are the areas most strongly associated with the gay community on Fire Island. While these fabulous LGBT havens are some of the most popular places to stay, you can enjoy gay-friendly stays and all the fun and freedom your heart desires anywhere on the island. You’ll see the white towers of the Belvedere as you approach Fire Island on the ferry. Its palatial front offers spectacular views of the bay and you can enjoy amazing sunsets from its terrace or front deck. It’s men only and the pool and sundecks are clothing optional, so if you’re looking for an open and friendly weekend away, this is the place to go. The staff is renowned for their approachability and welcome; you’ll be sure to feel at home. There’s a wide range of rooms to suit any budget – if it’s a trip for a special occasion splash out on a luxury room, preferably with a view of the sea. There’s even a complimentary breakfast on offer each Sunday if you need some sustenance to recover from your wild Saturday night! Reopened in 2017 after extensive renovation work required by a fire that destroyed much of the building, the Grove Hotel is a charming clapboard building with peaked roofs decorating its skyline. It is right in the heart of Cherry Grove so a perfect destination for weekend visitors who want to be in the middle of the action. Enjoy the good-sized pool before popping next door to the Ice Palace nightclub. Or if clubbing isn’t your scene, there are plenty of nearby cafes, bars and shops to keep you entertained for your weekend (or longer!). 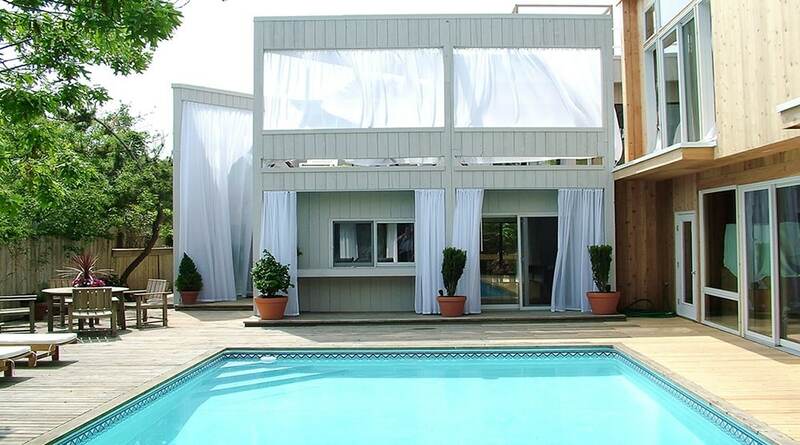 The Madison is a more low-key yet much more glamorous option among the Fire Island gay hotels. There’s a modern and beautiful building set in a secluded compound that feels far away from all the comings and goings of the main part of town, even though it’s only a minute’s walk. Minimal white décor with blonde wooden floorboards creates a clean, contemporary and elegant feel. Every amenity you can imagine is present, from air conditioning and en-suite in every room, to pool decks and massages. After a day’s relaxing and pampering, you can stroll down to the beach and watch the sunset. It’s a delightful retreat; perfect for me time, or time with that special someone. The Hotel is run by ShareGurl, a Fire Island company committed to helping a new generation of gays discover and love Fire Island. It’s the affordable option – but don’t let the word ‘affordable’ put you off. This is a true beach hotel, right on the shore, the kind of place where you can come back after a hot day on the beach, wash that sand off you then head out for a drink with fellow guests. There are Standard and Super Rooms, as well as Two Room Suites. We love the bright and breezy blue decoration in the rooms, which is a great reminder of the beach you’re just about to head to! Private bathrooms have plenty of quality toiletries to help you get ready for that Fire Island gay night out! 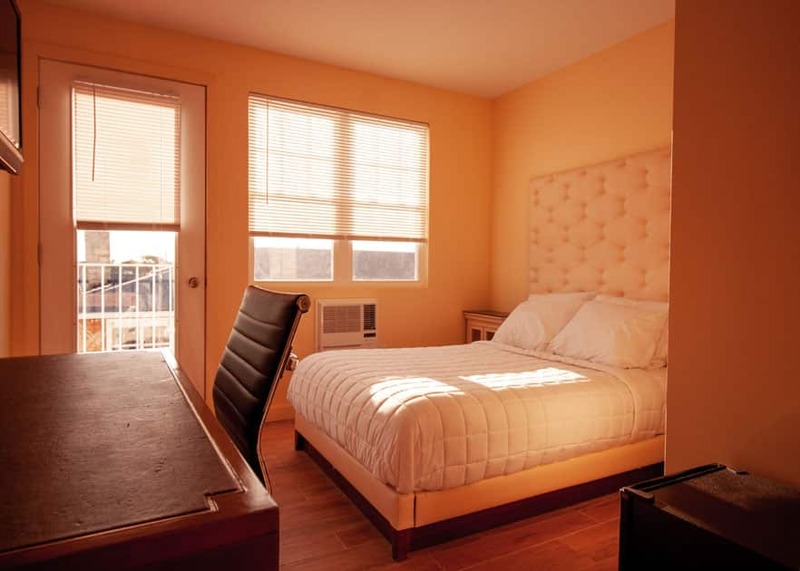 Enjoy incredible sea views at this decadent and welcoming Fire Island gay hotel – or, as it terms itself, a gay retreat. There are a range of private suites that are quirkily decorated and have all the extras your heart desires. Community spaces include the saltwater pool, panoramic deck and a living room for when you just want to kick back. It’s right on the beach and offers a range of beach and outdoor activity gear for whatever you might want from your Fire Island stay. There’s also a food plan option, so if you don’t want to go shopping you can pay $25 per day for unlimited food and drink. Come and stay at this retreat and you might seriously consider relocating to Fire Island. 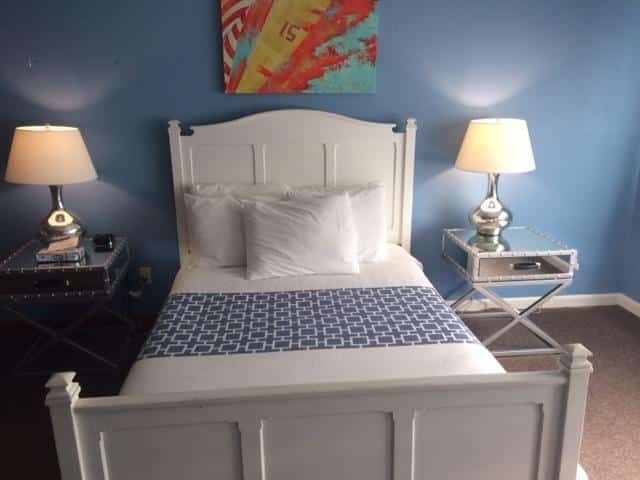 This charming oceanfront B&B is located right on Ocean Walk, perfect for that morning stroll. 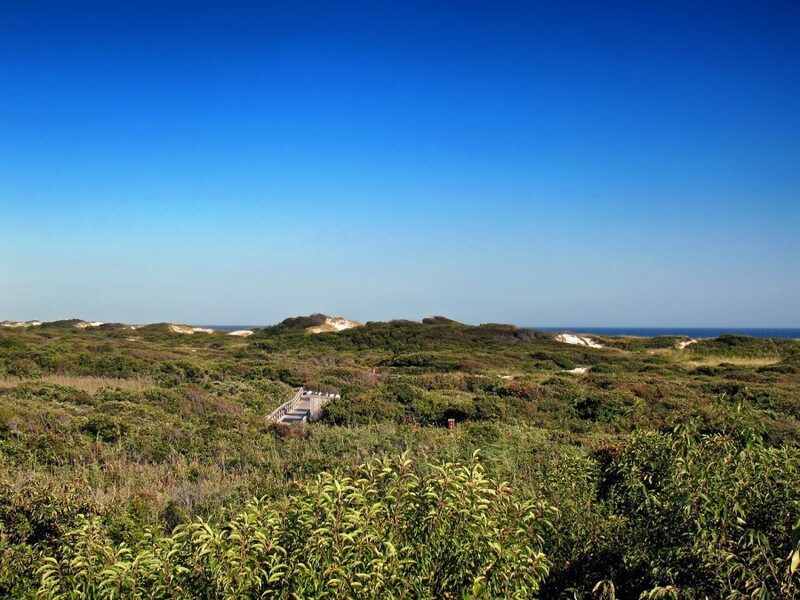 With the sounds of the waves crashing in the background, the Pines Bluff Overlook is the perfect choice for a more chilled out Fire Island weekend break. No matter what size your room, they all have private baths and sliding doors out onto the deck area. Enjoy an iced tea on the deck or jump in the rooftop hot tub to completely unwind. The owners are welcoming and go out of their way to make guests feel at home. They are even pet friendly, in case you just can’t bear to leave your pooch at home! Any of these fabulous Fire Island gay hotels offer you the perfect hub that you can enjoy the famous beach life and nightlife from – if you even manage to leave the hotel. With these turquoise pools, cool refreshments and the Atlantic on your doorstep, why even head out? A waterfront hotel located in Ocean Beach that has been faithfully serving Fire Island’s tourists since 1946. 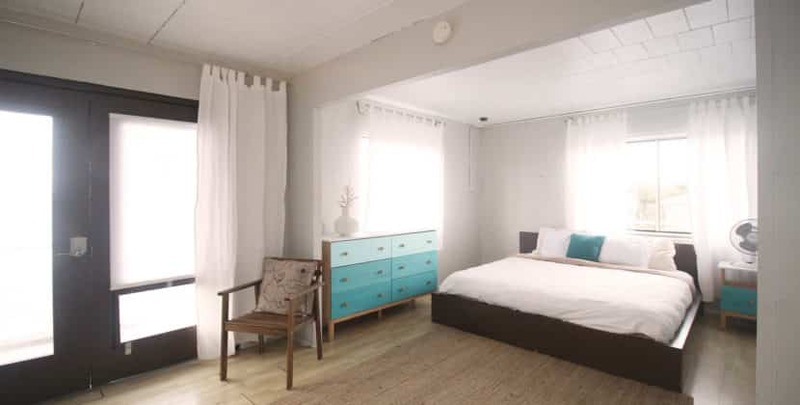 Clegg’s Hotel resembles a sailor’s rooming house with a charming, country blue decor and while it is not exclusively gay, it is a very popular LGBT-friendly Fire Island hotel option! Facing the Great South Bay, just steps away to all the town’s offerings and just a five-minute walk from the Atlantic Ocean it is no wonder Clegg’s Hotel has so many faithful customers who love that this quaint hotel for its peaceful and simple atmosphere while being located near everything of desire.